The idea of rentvesting has been used by highly dedicated and committed wealth creating property investors for decades. However, it remains a lesser-known approach to building an asset base. It deviates from the traditional ‘buy a home, pay it down and then buy an investment property’ approach, but it may well be the ideal path forward for many modern Australians. The intent of a rentvestor is to remain a tenant while also becoming a landlord. In doing so, they build their asset base independently of home ownership until such time as they can afford their much sought-after dream home. The question is: does it work and how effective is it really? In order to illustrate the value of rentvesting, let’s take a typical low- to middle-income couple and look at the choices they have in order to get started on their investing journey. We’ve introduced you to Kelly and Hamish, a hypothetical couple in their ’30s (see boxout, right). Save a deposit, borrow as much as they can and buy their own home – even if it takes them years. Then get into their first investment property by saving another deposit through earned income and by drawing on any possible equity raised in their own home. Again, this may take several years. Rent, save a deposit, borrow as much as they can, and buy an investment property. Repeat this while renting. Kelly and Hamish are beginning to feel like they’re missing out. Aged in their mid-’30s, they think they’ve been doing all right so far but believe there’s so much more they could be doing if they had their own home. In an ideal world Kelly and Hamish would have purchased their home some time ago, but they have always felt short of the money they needed to buy one. Now they’re facing pressure from two sides. Kelly and Hamish have not only seen property prices go up all around them, but they’ve now accumulated so much furniture in their small rental apartment that it’s beginning to cramp their style. They need more room. So, Kelly and Hamish have been diligently saving their pennies and are really beginning to look at what it would take to get ahead. The problem? In the suburb they want to live in, the houses they’re looking at are approaching the $1m mark. The solution? Enter the concept of rentvesting. The area they live in now as renters is ideal for them. It’s close enough to the city, work, friends and the lifestyle they want to continue enjoying. They’ve been looking around for the typical three-bedroom, one-bathroom house, but the sort of property they would like to buy has a price tag of about $900,000. In order for anyone to buy a $900,000 property, along with the six-ﬁgure deposit they will need, they will have to cover a few additional costs. These costs include stamp duty, legal fees, conveyancing, and maybe the cost of some initial repairs or maintenance. On average, this approximates to about 5% of the purchase price – but in real terms this is not exactly what every buyer will pay. Every state in Australia has different stamp duty expenses and first home owner incentives. As a consequence, it is important for any new homeowner to research what their expenses might be in their personal circumstances. For our example, let’s assume Kelly and Hamish will need 5% of the purchase price to cover these costs. So, in total, how much will Kelly and Hamish need to be able to purchase and settle on their $900,000 home? 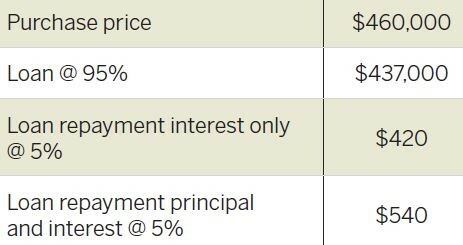 Table 1 shows that they will need between $90,000 and $225,000 in cash, and somewhere between $720,000 and $855,000 in borrowing capacity, to be able to purchase their $900,000 property. This means they will need somewhere between $693 and $822 per week to service the debt. 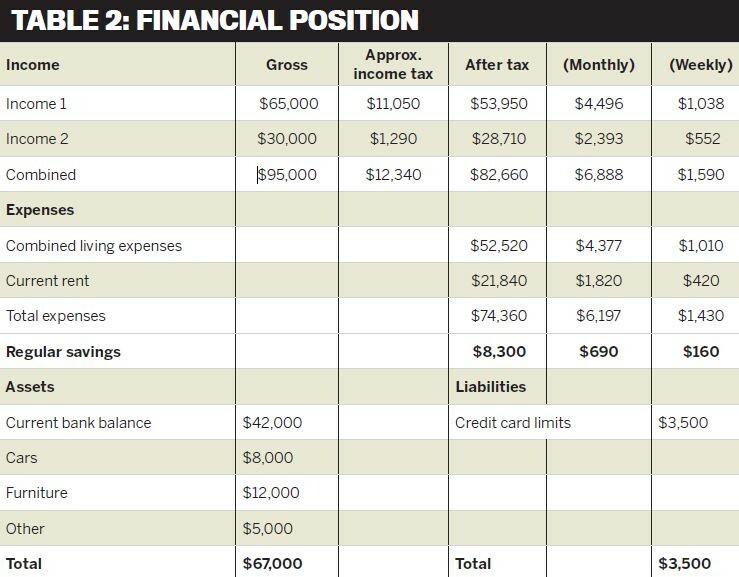 Let’s take a look at our couple’s financial position (Table 2). We can see that with $42,000 in savings Kelly and Hamish are about $48,000 short of the minimum deposit and settlement expenses they will need to be able to purchase their ideal property. To understand all the implications, it’s important to determine how much can be borrowed. So Kelly goes to a mortgage broker and Hamish goes to their local bank to make general enquiries … And the couple are surprised to discover they’re able to borrow more than they thought! Despite the good news, however, they are still at least $150,000 to $285,000 short of what they would need to borrow to purchase their $900,000 first home. 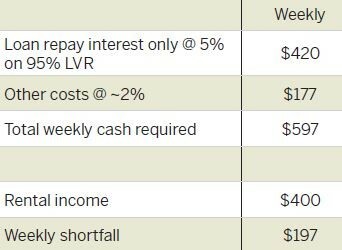 Even if they were able to get a loan approved, it would mean that our couple would need to sacrifice an additional $113–$242 per week of their lifestyle expenses – at a minimum – to service the debt (see Table 3). This news presents our couple with a decision: Do they continue to try to save up to be able to afford their ideal first home, or do they try something different? Kelly and Hamish could always move to the outer suburbs of the city for a while where property prices are cheaper, but the social sacrifice would be can afford, perhaps they may be able to get into their own home faster. As stated earlier, to buy any property you need a cash deposit and the ability to borrow money. For some cash-rich people, the limit of what they can afford to buy is dependent upon the amount they can afford to borrow. Our couple, though, are limited by the amount of cash they have for their deposit. There are three possible ways that owning this property will help Kelly and Hamish into their dream home: the rental income, the capital growth, and the paying down of debt. On the premise that the property will rent for somewhere near the average city-based yield, we can expect the additional rental income to be about $400 per week. This does not, however, make the property a positive cash flow transaction. Based on our calculations, Kelly and Hamish are able to save $160 per week. They need $197 per week. While there will be a small lifestyle sacrifice, it is quite possible that the extra $37 per week ($197–$160) required can be accommodated reasonably easily by the couple. They may even be able to fund this shortfall via tax deductions received as a consequence of investing, such as negative gearing and depreciation. While in reality the property market grows in fits and spurts, the average long-term rate of growth after inflation since 1901 has been just 3% annually. With inflation currently running at about 2%, for the sake of our example let’s assume 5% as our rate of growth. At this 5% growth rate, our couple’s property will have appreciated in value to the tune of $127,000 in five years’ time. Unfortunately, being an interest-only loan there will be no debt reduction during this initial period. The benefit, though, is that Kelly and Hamish will be living a lifestyle very similar to one they are enjoying now, because of a lower debt servicing requirement. They may choose to get a principal and interest loan; however, the extra cost of the repayments will need to be accounted for in their budget and spending. If Kelly and Hamish downgrade the quality of their rental home, they may have to tolerate a little less style and fewer amenities. However, the upshot of this is that they may also be able to pay a similar price for a rental home with the space they need to allow them to spread out a little, while not having to give up their social connections and current work-life balance. By buying a property in the outer suburbs and renting it out, as rentvestors Kelly and Hamish can get into the housing market now, and possibly fast-track their capacity to move into their dream home later. For a balanced comparison, we will assume Kelly and Hamish have increased their weekly savings by $37 per week in the ‘dream home’ example, the equivalent of the extra funding required to cover the shortfall in rent. We’ll also ignore household goods as assets. We’ll assume the lender has allowed the interest-only loan to be extended beyond the usual five-year period through refinancing. For simplicity, negative gearing has been loosely calculated as initially being a tax refund of $3,500 and is reduced by $500 every year as rents increase but loan repayments don’t. For simplicity, depreciation has been ignored (but it does have the potential to contribute to less tax being paid along the way). Let’s see how the numbers play out for Kelly and Hamish when comparing renting and investing for the next 10 years, versus saving to buy their ideal home. For ease of comparison, we will assume an annual increase in income, rent and expenses of about 2%, an increase of 5% on the value of the investment property, and no change in the value of the car, furniture and other assets they own. Initially, it appears that saving for a home is the better option for the couple because of the $23,000 in settlement costs that have just disappeared from their asset base. However, over the 10 years of rentvesting illustrated here, Kelly and Hamish could end up much better off! After a decade, it will be time to sell their rental property and relook at getting into their dream home. In order to sell a property, an investor is likely to incur some significant costs. These costs include real estate agent commissions, marketing costs and the associated legal fees (approx. 3% of the sales price) as well as capital gains tax (up to approx. 25% of the growth of the property). To sell their current investment and pay the tax, Kelly and Hamish will incur about $69,000 in costs. Even so, this would still leave about $257,600 ($326,695 – $69,095) in cash for our couple to buy their home. Through saving alone, our couple would have only $150,700. But rentvesting has allowed our couple to accumulate over $100,000 more! I’ve just outlined a ‘best-case scenario’. But there is a very real risk that the converse could happen. What if the property our couple purchased was in a suburb where prices ended up declining over the 10-year period? The consequences for their asset base would be devastating. One of the most common approaches to investing in property for beginners is ‘trial and error’. The problem with a trial and error approach to investing is the error! Buying any property anywhere and hoping it will be the solution to your financial dreams is dangerous. This approach to building wealth works best when you get the investing part of the rentvesting strategy right. That is, when the investment property you purchase experiences great growth in a short period of time. In order for our couple to make the most of rentvesting, it is important for them to spend some time and energy on researching what will drive prices up in areas they’re thinking of investing in. They need to know who will put the pressure on prices in the housing market in these areas, then look for a property this target market wants to buy. With this sort of research, they’ll be more likely to pick the right property in the right area to allow them to enjoy some great growth in a reasonably short period of time. By buying a property that is likely to be in demand in an area of great potential growth, our example has shown us that rentvesting has the capacity to help build our asset base faster. And if we continue to rentvest repeatedly and well, long into the future, we may be able to create great wealth faster than many homeowners. There are many stories in the media at the moment about how hard it is for first home owners to break into the property market. The market has changed. It’s different to what it was years ago. If you’re feeling a sense of despair about buying your first property and being able to break into the property market, by thinking a little more laterally, a solution may not be far away. Rentvesting may be the way you can break into the property market now and begin to create great wealth for yourself. Keep going!